Mixed methods research techniques, combining both quantitative and qualitative elements, have become well established throughout the social, behavioural and natural sciences. 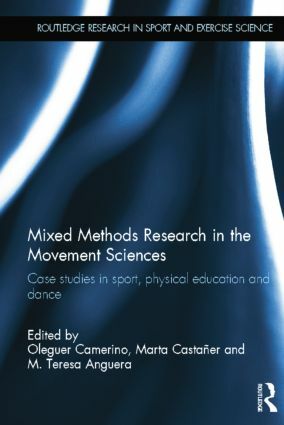 This is the first book to focus on the application of mixed methods research in the movement sciences, specifically in sport, physical education and dance. Researchers and practitioners in each of these fields are concerned with the study of habitual behaviour in naturalistic contexts, and of the concurrent and sequential nature of events and states, precisely the kind of work that multi-method research design can help illuminate. The book is arranged into four sections. The first provides a thorough overview of mixed methods procedures and research design, and summarizes their applicability to the movement sciences. The remaining sections then offer detailed case studies of mixed methods research in team and individual sports (analyzing hidden patterns of play and optimising technique); kinesics and dance (analyzing motor skills behaviour in childhood, and the complexity of motor responses in dance); and physical education (detecting interaction patterns in group situations, and optimizing non-verbal communication by teachers and sports coaches). Mixed Methods Research in the Movement Sciences offers an important new tool for researchers and helps to close the gap between the analysis of expert performance and our understanding of the general principles of movement science. It is important reading for any student, researcher or professional with an interest in motor control, sport and dance pedagogy, coaching, performance analysis or decision-making in sport. Oleguer Camerino is Professor of Physical Education Pedagogy and Head of Research and Observational Methods at the Human Motor Behaviour and Sport Laboratory (http://lom.observesport.com/) at INEFC—University of Lleida, Catalonia, Spain. Marta Castañer is Professor of Human Motor Behaviour and Head of Observational Methods at the Human Motor Behaviour and Sport Laboratory (http://lom.observesport.com/) at INEFC—University of Lleida, Catalonia, Spain. M. Teresa Anguera is Professor of Methodology of the Behavioural Sciences (Faculty of Psychology) and Head of the Observational Designs Research Group (http://www.observesport.com/) at the University of Barcelona, Catalonia, Spain.